National broadcasters are an easy target. Hall of Fame announcer Tim McCarver, for example, had a whole website dedicated to his quotes (though it seems to have been taken down). FireJoeMorgan.com was a hit back in the day, dedicated to its namesake and many others, and other sites have sprung up to immortalize the gems coming from the mouths of the best and brightest. Now, I understand that their job is pretty hard. We’re spoiled by the fantastic broadcasters in San Francisco. Kruk and Kuip do a great job of analyzing the game while providing insight into the players, and Jon Miller and David B. Flemming are great. But this is what makes it so hard to watch these national broadcasts, particularly with today’s broadcast crew. It’s not that it’s just “East Coast Bias,” whatever that is, if that really exists. But what really struck me listening to today’s game was just that these announcers have clearly watched a lot of Phillies games and know the team really well; on the other hand, they know next to nothing about the Giants besides what they can glean from stat sheets. This is especially apparent when they refer to all of the Phillies players by the first names – a pet peeve of mine – describing Gregor Blanco a “role player” and then proceeding to list players faster than him, or saying that the Giants’ offense has been suffering as a result of Aubrey Huff and Hector Sanchez being on the DL. That’s just incorrect. But I digress. National broadcasts are a necessary evil when you’re a baseball fan, like camera angles behind the catcher, overpriced beer and advocates of the designated hitter. Let’s talk about the game. Matt Cain was less than sharp, but he deserves a good deal of credit for not letting the game get away from him. 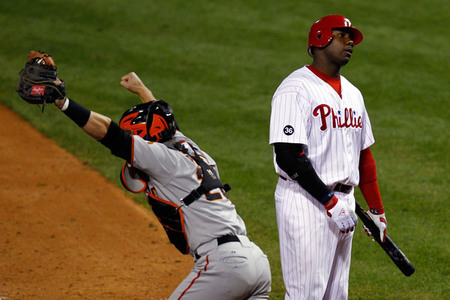 After giving up the home run to Ryan Howard in the 6th, Cain sat down the next eight Phillies batters in order, including three strikeouts. For a game in which he gave up three homers – he’s averaged less than one homer per start this year – Cain saved the bullpen and got better as the game went on, and didn’t lose his composure. And he homered and pegged Chase Utley, so what’s not to love? Belt: Ouch. 0-5, with 7 LOB. I understand that Bruce Bochy batted Brandon Belt 8th today probably to reduce pressure on him, or something like that, but it sure didn’t work. I’d like to go on thinking that he’ll get it together, and he does need to continue getting regular at-bats, but man. There’s something wrong. Crawford: Pinch hit appearance. You can’t predict baseball.